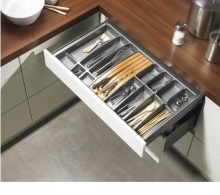 Hettich has the right drawer system for any type of furniture. Whether it’s for the kitchen, bathroom, bedroom, living-room or office, Hettich drawers offer ingenious concepts to suit any application. 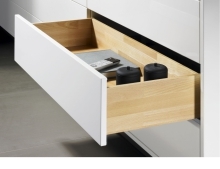 Sturdy, smooth-running, convenient, attractive are key features of Hettich drawer systems. Single or double-walled side profiles in a wide range of options combine with a comprehensive range of accessories optimised for different target groups. Innotech is a system with one aim; to create marks of distinction with cost-effective platform concepts. Innotech has been the industry’s most versatile drawer system for years. The system is totally customisable and can tailor to the internal design of any kitchen to compliment the exterior design. The system, available in three finishes; silver, white and anthracite can be used in a variety of applications – full & part extension, silent system dampening, electronic or mechanical push to open mechanisms in 30 & 50kg capacity variants. 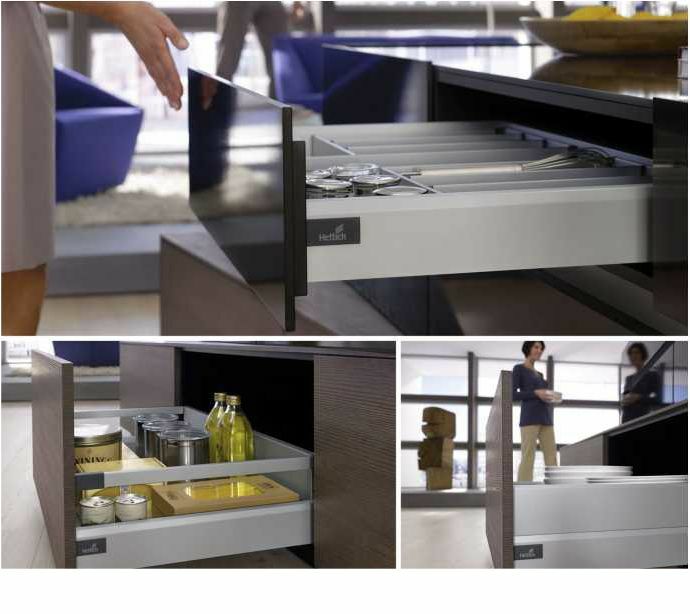 In addition to these platforms,Innotech continues to provide customisable drawer sides for pot-and-pan drawers. The most recent of these is DesignSide. DesignSide panels are a stylish alternative to more utilitarian style railings. Although it comes standard in float glass, the system can be customised with any 6mm material to express your individuality, style and taste. From glass & stone to acrylics & timbers, plus everything in between, the possibilities with DesignSide are endless. The perfection of Hettich Quadro runners is unmatched. Quadro enhances the best qualities of the ball bearing. Four independent rows of steel balls run in precision steel profiles. Always gliding quietly with perfect precision, Quadro is the unsung hero of any high quality drawer. Quadro runners sit as if invisible,underneath a wooden box, and as with InnoTech; the system is customisable with a variety of options. These include Silent System in either full and part extension applicationsor push to open mechanical with varying load capacities. Making light weight of moving heavy drawers - this is where ArciTech excels. ArciTech is the perfect choice for producing high and wide drawers as well as fitting heavy front panels. The sturdy Actro runner carries loads of 80kg, allowing drawers to open and close more quietly and more gently than any other. ArciTech lets you meet even the most exacting demands on kitchen and living room furniture. The versatile platform concept allows customised solutions while keeping production lean and efficient.